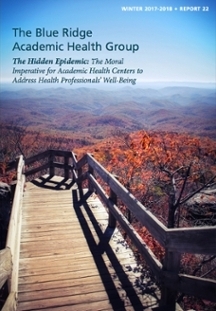 "The Hidden Epidemic: The Moral Imperative for Academic Health Centers to Address Health Professionals' Well-Being," was prepared by some of the most influential leaders in academic medicine. A new report by the Blue Ridge Academic Health Group (BRAHG) examines and recommends responses to the growing epidemic of clinician burnout, which affects not just doctors but also nurses and other health professionals. This phenomenon is becoming a crisis in health care delivery, with staggering costs in lost productivity, risks to mental and physical health, eroding quality and safety, diminished patient satisfaction, staff turnover, lost dollars, and at the extreme, a high personal toll of depression and suicide. The 2017-2018 report, titled "The Hidden Epidemic: The Moral Imperative for Academic Health Centers to Address Health Professionals' Well-Being," was prepared by some of the most influential leaders in academic medicine. The Blue Ridge Group studies and reports on issues of fundamental importance to improving the U.S. health care system and enhancing the ability of academic health centers to sustain optimal progress in health and health care through sound research and health professional education. Blue Ridge Group co-chairs are Jonathan S. Lewin, MD, executive vice president for health affairs, Emory University; executive director, Woodruff Health Sciences Center; and president, CEO, and chairman of the Board, Emory Healthcare; and Jeffrey R. Balser, MD, president and CEO, Vanderbilt University Medical Center, and dean, Vanderbilt School of Medicine.